BlogPaws Wordless Wednesday Pet Blogger Hop: #BlogPawsorBust ! 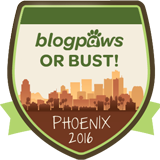 Our friends at BlogPaws are having an amazing contest: First prize is a trip to the BlogPaws conference in Phoenix, AZ this June! Why not throw your hat in the ring for this fantastic opportunity? Remember this picture from the very first BlogPaws Conference in Columbus, Ohio? That's Andrea Arden, me and Parental Unit! Andrea specifically said that "Scruffy" was her favorite breed...and of course, we agree! Now let's head on over to the BlogPaws Wordless Wednesday Pet Blogger Hop and see what's happening with our blogging buddies! I fit da scruffy mode too! A blast from the past! I love it!